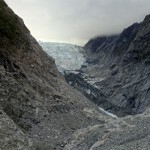 Today we took a walk up to the Franz Josef Glacier, we decided not to climb it as Bells has a bit of a phobia of ice. It was nice just to look at though. The Glacier has retreated somewhat in the past years and this is mostly blamed on the effects of Global Warming. I wonder what the future of it will be.